As a company heavily reliant on customer service, we have to ensure we give each and every customer the best experience possible. Shutterly Fabulous bases itself on value, on service and on quality. To keep true to this mantra our service, specifically customer service, has to be kept courteous, professional and personal. We train each member of staff in the manner we expect them to relay to our customers and we may be bias, but we think they do a pretty good job! The great thing about the internet is it gives everyone a voice, no longer do you have to rely on a website publishing a few select ‘customer stories’ on its own page. 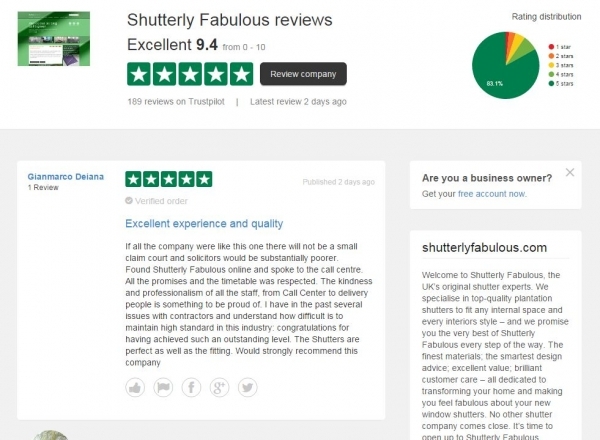 To ensure we are fair and trusted we partner with one of the largest and most validated review sites, Trustpilot. Trustpilot use a number of algorithms and checks to ensure reviews left are fair and helpful to the community, so you know you can place your trust in the reviews left there. At the time of writing, our Trustpilot score stands at 8.9/10 (Updated in December 2015 to 9.4), in comparison our main competitors’ Trustpilot scores stand at 6.3 and 6.7. We believe this is down to the in depth personal touch our advisors, consultants give and the pride our installers take of a job. A recent review stated, “One of the best service deliveries ever – whole house shutters installation Little Venice. In my 35 years of experience of major refurbishments, I have never come across such a professional, competent, caring, friendly team who produced a first class fit and sorted each hiccup without a single complaint or negative reaction to any obstacle. This only the third “outstanding” review I have given. Without a doubt, SF initial competitive advantage lay in the skills and experience of Paul selling me the product. His clear confident competence blew competitors such as Thomas Sanderson out of the water.